This evening I saw Addictive TV perform at Cenart. A duo of Graham Daniels and Mark Vidler, they've been around for 15 years but I think this was the first time I've seen them play live. Basically, they sample both music and video to create a hybrid combination of the two. So they can take a rhythm, chord, vocal or found sound and then make a song out of them, looping them, punching them in and out of the mix. Nothing new about that. 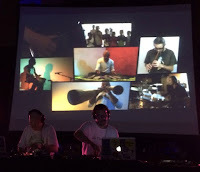 But what makes it interesting is that the source is audio-visual, so the visuals of the musicians playing the rhythm, chord, vocal and whatever can be similarly manipulated. 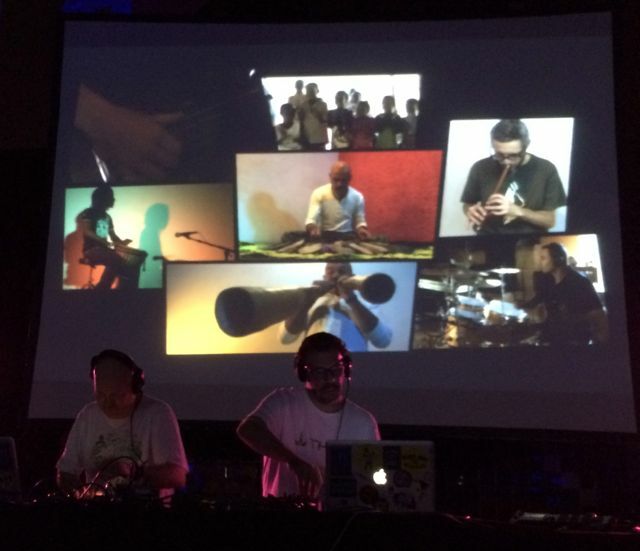 The first half of the show was a fairly recent project called Orchestra Of Samples in which they asked lots of unknown musicians around the world to film themselves playing a rhythm, chord, vocal etc and then send the files to London. Daniels and Vidler then went to work creating songs, and composite videos, out of them. So the screen you can see here shows the videos being punched in and out according to whether they're in the mix or not. Simple but effective. So that was world music. In the second half they did what they're best known for which is sampling movies (Transformers), TV (Star Trek) and music videos (including a great combination of Blur's Song 2 and Stevie Wonder's Superstition) to create more of a club night.